The last week of my first trimester was the type of week where whether I was pregnant or not I would’ve been frustrated with my work-outs, or lack thereof. It was a week that started with yet another snowstorm and super cold days; followed by lack of motivation to get up early and do the basement workout; followed by a late event at work that also hindered motivation for a run the next morning. I managed a 30 min cross-training session Monday and a 3 mile treadmill run with a little bit of strength work on Tuesday. I was banking on the weekend to round it all out and a 3 mile run on what was finally a spring day on Saturday got me out of the slump of feeling like I’d ruined any fitness progress for the week. What I’d really been hanging my hat on was the 10k race I’d registered for on Sunday which happened to coincide with a few days past the first week of the second trimester. There are plenty of things about this pregnancy that are already different than round one but one is that certain things seem to be happening sooner, like the need to pee frequently. For the life of me, I will never understand how a 2-3 inch pea pod can so greatly disrupt a woman’s internal functions but that’s what happens. (For the record, parts of this post are likely TMI and are intended to help answer the questions and curiosities of other pregnant runners who are looking for answers about things that most people don’t talk about.) I was excited for the Get Pumped for Pets 10k for two reasons: 1. it would force/allow me to run more than 3-4 miles and 2. it would give me a sense of where I’ll be in another 4 weeks at the Cooper River Bridge Run 10k. Despite the spring forward time change I was up early enough at home to “take care of business” THREE times. I had one small cup of coffee and hardly any water for fear of contributing to the need to pee. Nonetheless, I hit the porta pot twice before the race AND I used a fortuitously placed porta pot at mile two. I strongly debated hitting it up again on the out and back course and decided it was all mental and that I could power through the remaining 2 miles to the finish. Of all the changes that pregnancy causes in running–the slower pace, the lower back pain, the heavier breathing, the strange inability to extend my legs the same way–the odd and annoying need to pee is what bothers me the most. I don’t know if it’s the motion of running (definitely could be as this does not happen when I’m sitting on a spin bike) or my form that maybe puts more pressure on my urinary tract…I don’t know, but it frustrates the hell out of me. However, I’m stubborn. So I will continue to run, I will continue to keep my distance up for as long as I can and when I have to pee, I’ll find a way to get it done. 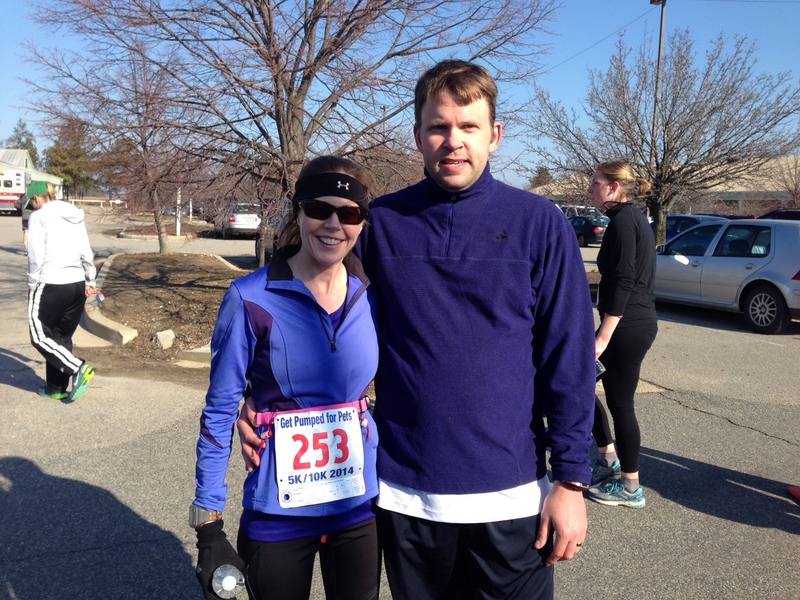 So, enough about that and more about racing a 10k pregnant. Like any other race I went out too fast. Pregnant or not I’m competitive. I set an expectation a few weeks ago that runs longer than 3-4 miles would likely creep over a 9 minute pace and I need to be ok with that. And yet my first mile was in 8:30. Also like many other races, it took me a couple miles to really warm-up and get into a groove. I just really enjoy racing. I like the mental challenge of keeping up with certain runners, finding someone to “target,” maintaining a sustainable pace, focusing on form and performance. Any runner can do this whether you’re racing to all out win or running 12 minute miles. Racing is about focus. A little before the halfway mark I found myself thinking thoughts similar to those I’ve had at about the 16-18 mile mark of a marathon. Why do I need to run this far? Couldn’t I just scale back? How did I ever think I could tackle a half marathon at 5 months pregnant (an idea I’m toying with)? And then less than a mile later my negativity and hesitation was replaced with remembering that I like the satisfaction of distance running. I want to maintain distance during pregnancy for as long as possible. Distance running pregnant is not about time. Perhaps I can do a half marathon (so long as I can stop to pee!). And with the .2 miles to the finish I decided to “race.” I ran a little harder to feel the fun of speed and clocked a lovely 7:24 pace for that final little stretch. One perk was having my husband at the finish who had just run his fastest 5k ever and came in first in his age group. For a guy that HATES (and I mean it in an all caps way, HATES) running, his competitive juices are in full swing for a friendly bet around the Cooper River Bridge Run and it is awesome to see him so motivated. It is also insanely frustrating to not be able to compete against him. But there’s always next year.